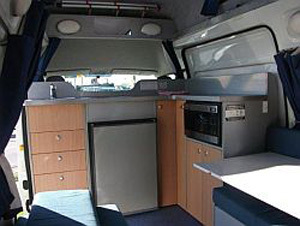 This long-wheel base campervan with high rooftop extra roomy indeed! 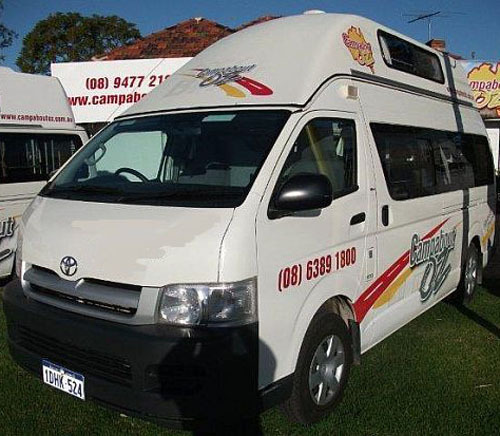 Seating up to 5^^ people, you can take the whole family on your self-drive holiday. There’s a DVD and TV to keep the children amused and we’ll even supply FREE camping and sleeping gear to make sleeping arrangements easier. Seating: 3 Front Seats + 2 Back Seats IMPORTANT: Children must be over 7 years old to travel in a front seat. Vans seat 3 people in the front cabin and 2 people in the back. Children under 7 years old cannot travel in the front seat. 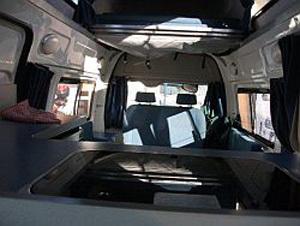 Top bunk: 2.00m x 1.37m (max weight for top bunk 200kg). Sleeping FREE tent/sleeping gear supplied for groups requiring extra bedding. Linen, pillows, sleeping bags supplied. ^^ Vans seat 3 people in the front cabin and 2 people in the back. Children under 7 years old cannot travel in the front seat. Children must be 7 years or older to travel in the front seat. Click here to read more.